I thought I'd have my act together this week to get some projects shared but it seems that since I didn't have much time or energy to stamp last week that means I don't have any projects to share this week! And next week is stamp club so I'm busy designing and making a mess in the stamp room to get ready for that. A vicious cycle I tell ya! I do have a card that I whipped up for my now 10 (!!!) year olds birthday a few weeks back. The Animal Outing stamp set hadn't seen any ink since I ordered it in June so I thought it was high time to play. I colored him in with watercolor pencils and a blender pen and cut him out with the Stitched Shapes square framelits. The sentiment is from the Tabs for Everything set (I love the small mix and match words) and then punched and layered. I added a few sprigs of Call Me Clover die cut leaves to keep the card from being too blah with the parched plains tan-ish color palette. 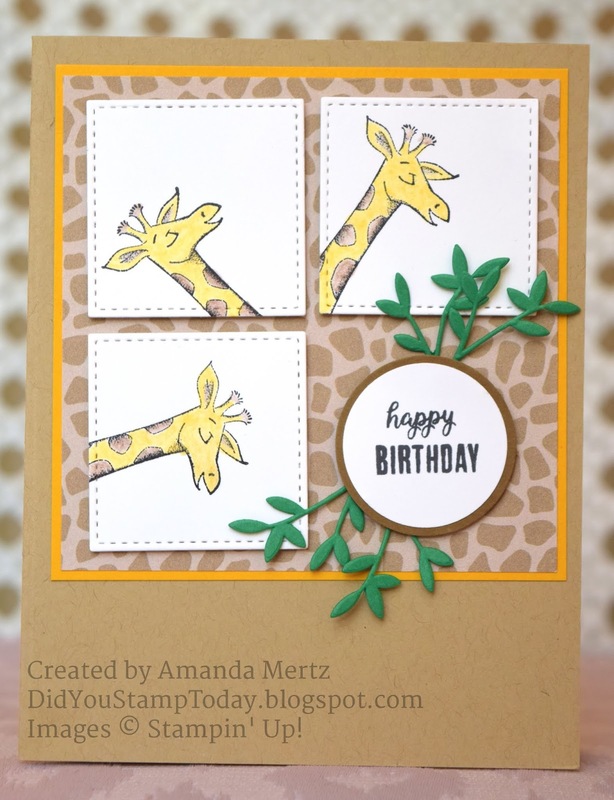 The Animal Expedition paper was a fun addition to the background for a bit of animal print goodness.